This September, watch out for the Wiki Loves Monuments USA photo contest. Admit it, you love the Wiki project. It’s given us Wikipedia, whose beyond-impressive compilation of facts, popular knowledge, images, and links (in more languages than you even knew existed!) has gotten so many of us through difficult school/work/life assignments. Little wonder it took the labor of folks around the entire planet, banded together remotely, to make it happen! If you’ve ever wanted to contribute to the big community effort behind Wikipedia, now is your chance. Dust off your favorite stand-alone cam, or just grab your nifty do-it-all phone and walk, bike, or drive to the nearest spot in your neighborhood that’s listed in the National Register of Historic Places. And don’t worry, there’s a Wikipedia page to find out which sites near your personal coordinates make the cut. Get a Wikimedia Commons account if you want to participate. Although we’re directing you to the USA page only, thirty-five countries in total are taking part in the contest. The goal is to make high-quality images of registered historical places available to all. 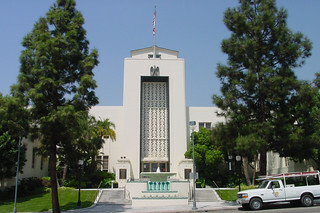 Above, a Wikipedia image of Burbank’s City Hall, only a short distance from Submit Express, and which is listed with the NRHP. The contest is on this month.